Aparna Serene Park is a residential development of Aparna Constructions and Estates. Located in Kondapur, Hyderabad, it is built across a wide area. These luxurious 2BHK and 3BHK housing units make it a dream home to everyone. These apartments are beautifully crafted with modern amenities. Kondapur is a premium locale close to many established government institutes and hospital. The residential market of this locality has witnessed a rampant increase in the commercial space has encouraged the developers to cater the mushrooming housing demand. Also, named among the most desirable cities in India, the realty market of Hyderabad has plans to further expand its fleet of construction projects and give space to some more residential and industrial projects. What is the project location?The project is located at Kondapur, Hyderabad. What is the area of apartments in Aparna Serene Park? The area of apartments offered in the project ranges from 1295.0 sqft to 2250.0 sqft. What is size of 2 bhk in Aparna Serene Park? 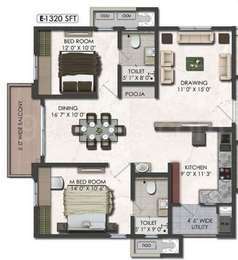 The area of 2 BHK apartments ranges from 1295.0 sqft to 1320.0 sqft. What is size of 3 bhk in Aparna Serene Park? 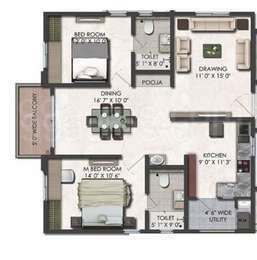 The area of 3 BHK apartments ranges from 1490.0 sqft to 2250.0 sqft. What is total size of Aparna Serene Park?The project is built over an area of 19.0 Acres. 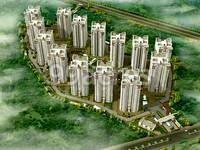 What is the price of 2 bhk in Aparna Serene Park? The project offers 2 BHK units within Rs. 7656000 to Rs. 10000000. Hi Damodar, Aparna Serene Park is an under-construction project and possession is expected by March 2019. The project is spread across 19 acres of land and features 14 towers with 20 floors and 1680 units. Apart from regular amenities, the project has aerobics center, yoga/meditation area, piped gas, CCTV camera security, grocery shop, swimming pool, water softener plant, car wash area, and clubhouse, among others. The project comprises 2BHK and 3BHK apartments, but to know the rates, I would suggest you to visit the builder's office and get in touch with the sales representative. Did you book before September and paid more than 4899 per sft, I know of folks who got in September at that price, and trying to form a group of people to discuss with Aparna the same. Contact me @ @.